This Cryo CO2 Jet Blaster is the perfect addition to any Nightclub or Dancefloor that wants to take their special effects to the Next Level. cooling down an area or dancefloor with CO2 Cold Air/Gas in seconds and providing an awesome special effect for the crowd, stages, or performance area. 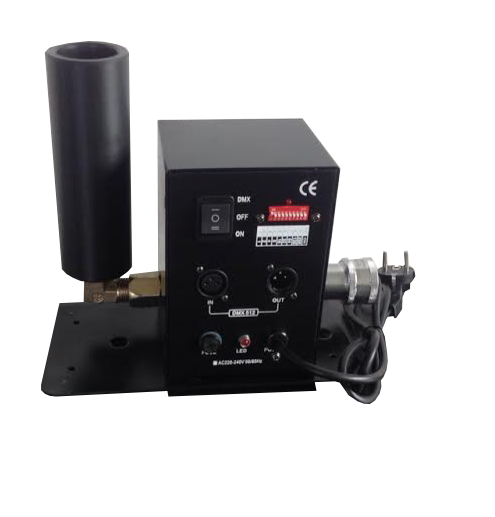 Our CO2 Jet Blaster install piece works with high and low pressure CO2 Systems and is available in 110VAC, or 220VAC. This unit comes ready to use, pre-assembled, it is lightweight with a high CO2 output, and very easy to hook up. Included is a instruction manual and installation guide as well as 15 feet of our high pressure CO2 Hoses with quick connect and high quality brass connectors. This Cryo Jet is ready to go, multiple units can be linked together, Controlled manually (Electronic Control) or with DMX 512 Controls. Take your Dancefloor to the Next Level in Special Effects and Cool Off the crowd while they dance the night away in style! Disclaimer: Nightclubshop is not responsible for any misuse that may lead to any injuries. Nightclubshop iss also not reponsible for any professional installation, because this equipment DOES NOT require it. You will be solely responsible if you decide to modify or professionally install the equipment to meet your standards. .